Given an unsorted array of integers, find the length of longest increasing subsequence. 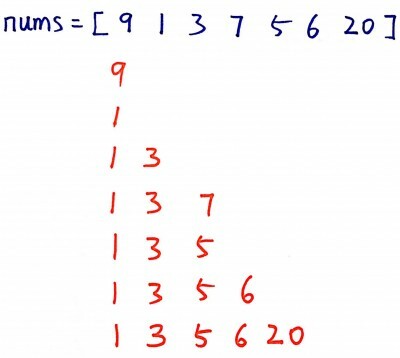 For example, given [10, 9, 2, 5, 3, 7, 101, 18], the longest increasing subsequence is [2, 3, 7, 101]. Therefore the length is 4. Let max[i] represent the length of the longest increasing subsequence so far. 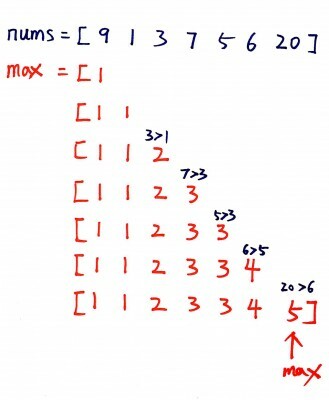 If any element before i is smaller than nums[i], then max[i] = max(max[i], max[j]+1). We can put the increasing sequence in a list. Note that the problem asks the length of the sequence, not the sequence itself. The 1 2 3 10 is just an intermediate result, it it not the longest sub sequence. For input 1,2,3,7,8,4 it replaces 7 with 4 and list is 1,2,3,4,8 which is wrong. Need to alter logic. why not use stack for nlogn solution? the solution 2 is not correct. It’s asking for the longest sequence count, Not the actual longest sequence. The longest sequence is 4. If they where asking to print out the longest sequence, you would be correct. In that case, you would also handle the case when there two sequence with the same length. Output produced is 1 2 3 10 which id definitely not longest increasing.